Samsung has made great strides to fix its custom Android UI over the past few years, going from the bloated and ugly TouchWiz to the less-bloated and sleek Samsung Experience. Unfortunately, its emoji have continued to be terrible, often expressing radically different emotions than those of other brands. Thankfully, Samsung is finally doing something about that as it rolls out Android Oreo to its suite of flagships. As first reported by Emojipedia, the Oreo update includes Samsung Experience 9.0, which brings redesigned the redesigned emoji in addition to a host of new features. 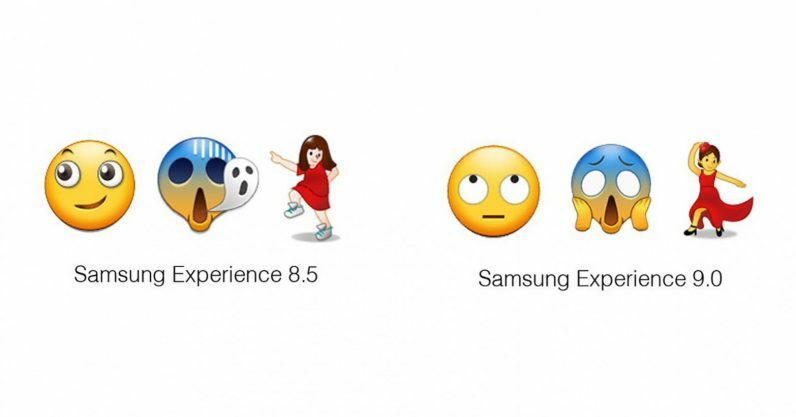 Although the overall aesthetic of the emoji hasn’t changed – I much prefer Google’s stock emoji – Samsung is trying to at least make its emoji convey the same emotions as everyone else. …which would make you look like a cannibal. The update also includes the new characters introduced with the Emoji 5.0 standard back in May of 2017. It’ll be a while before Samsung catches up to the new 2018 list – which probably won’t show up until the second half of the year – but at least the older emoji actually make sense now.